Joanmarie and Ron Provo have great shows coming up at the Royal Hamilton Light Infantry. To remind everyone what a great time they will have at Joanmarie and Ron Provo’s shows, I am posting some photos from past shows at the RHLI. Following the photos, are posters for four upcoming shows from September 30th to November 24th, 2018: Two shows are at the RHLI in Hamilton, ON; the second poster is for a at the Army, Navy and Air Force in Simcoe, ON; and the third poster is for a show at the Royal Canadian Legion in Dunnville. October 3rd, 2018 Amendment: Please note the changes for the Simcoe show in the poster below. 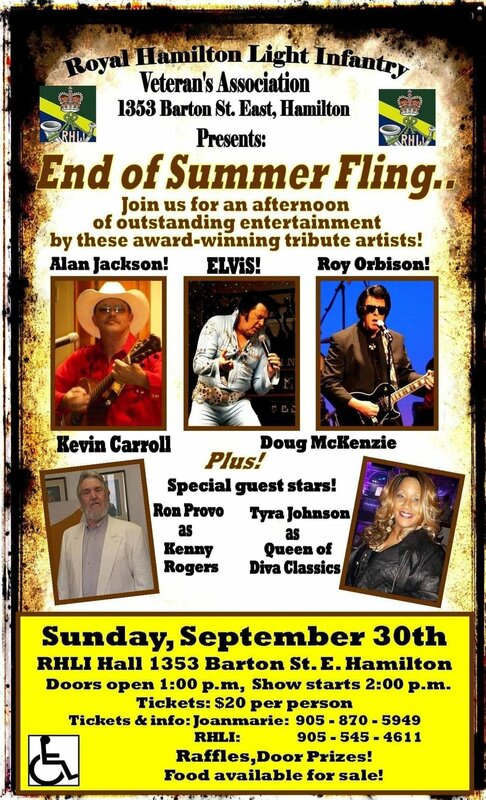 Cathy Carbone, as Connie Francis, Anthony Joseph as Tom Jones, and Derek McCarthy as Johnny Cash have been add to the lineup and will join Ron Provo as Kenny Rogers, and ETA Ed Butski. We all are thinking of you, Gus, and sending our love.